NASA is currently spending only 5 million dollars a year looking for huge earth crossing asteroids. Thankfully so far none has been found, however very little effort has been done to locate many of the smaller still highly dangerous asteroids. A new daring plan devised by a physicist and an astronaut Ed Lu is looking for several hundred million dollars to help fund the building of a unique space telescope to help keep our planet safe from those smaller ones. Why you ask? because nobody else is doing that! A foundation known as B612 (the name of the asteroid home of the Little Prince from Saint-Exupéry’s well known novel), set itself the goal of sending a special infra red telescope out into deep space that will discover and map the locations and trajectories of about half a million asteroids whose orbits could possibly intersect that of the Earth in the future. According to the B612 Foundation official statement, its main mission is to "protect the future of humanity on Earth while opening up the Solar System". B612 worked for almost 10 years on the technical problem of asteroid deflection as well as on increasing the awareness of both the public and politicians to the issue. B612 also states that: "over the years it became clear that deflecting asteroids is a solvable technical problem as long as there is adequate early warning (decades of notice). It also became clear that the job of tracking asteroids to provide early warning was not going to be accomplished by others in a timely fashion, so in early 2011 the B612 Foundation changed its focus to mapping the inner solar system". The telescope project known as the Sentinel mission is led by Ed Lu, a former astronaut who spent time on both the space shuttle and the international space station alongside former Apollo astronaut Rusty Schweickart. Looking on the earth from a few hundred kilometers away gave both of them a different kind of perspective on our planet. During the past year B612 worked with Ball Aerospace in Colorado, a company which specializes in building space telescopes, on a design for the future telescope and it also signed an agreement with NASA to use the agency’s long range equipment for communication with the telescope. The telescope itself will be launched into deep space orbit, according to B612 it will set somewhere around the Sun, near the orbit of Venus. One of the biggest issue is going to be money. Currently there is no exact estimate as to how much it will cost to build, launch and operate the telescope but B612 mentioned several hundred million dollars as a general ballpark. B612 hope to get this money from private philanthropic sources rather than some sort of government organization and although nothing like that has ever been done on a deep space mission before, B612 claims that this level of financing is not far from other civil projects such as building a new museum, performing arts center, or academic building (which are taking place all over the world all the time based on private donations). 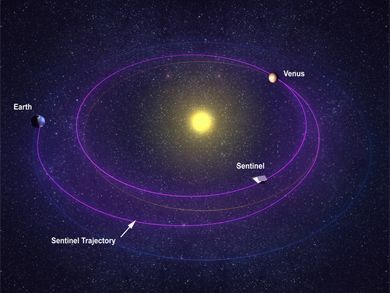 CAS Science in Action – Sentinel Mission from D Josh Rosen on Vimeo. More information can be found on the B612 foundation website.